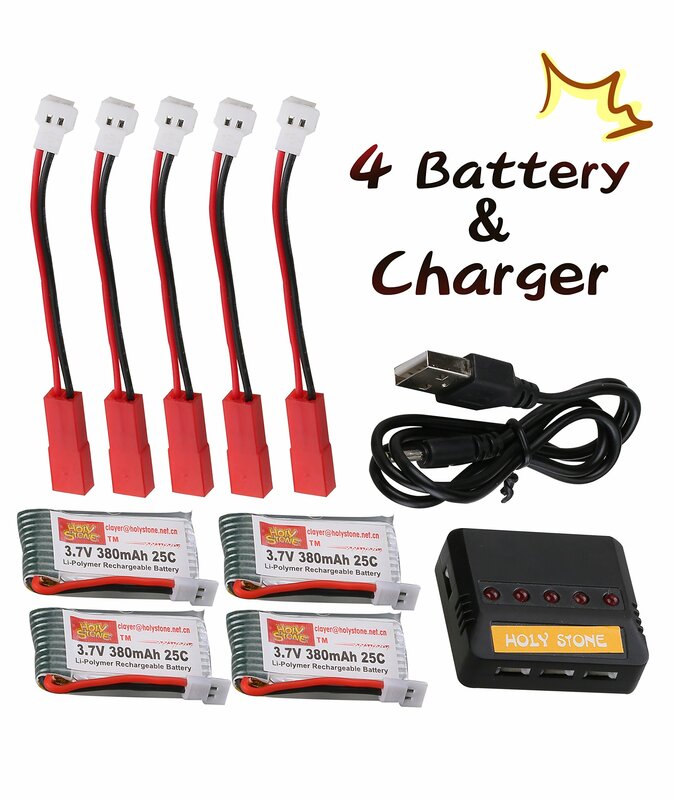 Home › Toys › Deerc 4 Pcs 3.7V 380Mah F180C H107 Hs170 25C Lipo Quadcopter Batteries To Inc.. BATTERY ONLY FIT FOR F180C HS170 Hubsan X4 H107 MJX F47 F48.5 in 1 X 5 battery CHARGER with 5 converting cables to enable this charger to fit for much kinds of batteries like X5C,X1,Holy Stone F180, WLtoys,Hubsan,UDI 818A, RC Helicopter etc. Which quadcopter is suitable for the Battery and Battery Charger: THE BATTERYCONNECTOR IS JST-XH PLUG BATTERY ONLY FIT FOR F180C HS170 Hubsan X4 H107 MJXF47 F48. Compatible RC Quadcopter battery of the battery charger: Hubsan: H107H107L H107C H107D. Wltoys: V202 V252 V939. UDI: U816 U816A U830. JXD: 385 388392. X5 X5C. FY: FY310 FY310B YIZHAN: X4. JJRC: 1000A 1000B 5000. DFD: F180.Product Dimensions : 5 IN 1 Fast Batteries Charger Adapter:1.810.4 Inch 3.7V380mAh Battery:1.50.80.4 Inch When the battery is charging, the light oncharger lit. When finished, it will off automatically. Over charge protectionand Short circuit protection Total Configures:1 charger, 1 USB cables,5converting cables,4 F180C 3.7V 380mAh Batteries If you have any product issue,pls contact us at the first moment .Our company have a proffessionaltechnical team and customer service ,we can offer you a Technical Guidance.